Not all the Custom Baseball Coach Gifts need to be personalized. DELETE any text you don’t want or change it to Your Text. For Multiple Different NAMES, Personalize ONE Coach Gift at a Time, “Add to Cart” then Go Back to customize the next gift for coaches. 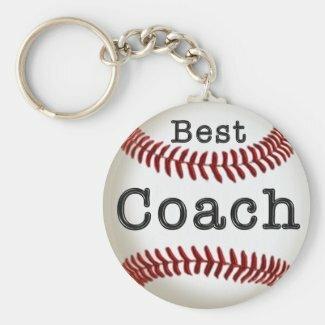 The most popular Personalized Baseball Coach Gifts are the Mugs that I sell with keychains and watches next. Buy the keychains in bulk. 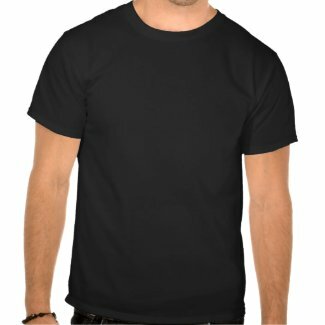 Feel free to call Linda for Help or if you would like me to make changes to ANY of my designs on ANY Zazzle product. Many Baseball Coaching Gifts to choose from with all budgets in mind. Personalize EACH Baseball Coach Gift Separately, “Add to Cart” then go back and customize the next personalized baseball gifts. You will still receive the Bulk Discount as applicable and they will be shipped altogether in one shipment. Custom Personalized Baseball Coach Gifts. Look for the Baseball Instructional Videos Link and the Motivational Baseball Videos near the end of this article. See the Full Baseball Category of Gifts Below. Click on the Big Baseball to view ALL of Little Linda Pinda Designs Baseball Stuff for Boys, Coaches, Team Gifts and Parents. You will have such a great time seeing the faces of people who are receiving these super special personalized baseball gifts. 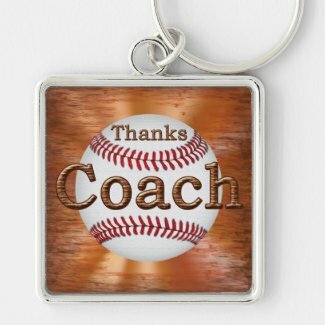 Cheap Softball Gifts for Coaches (Baseball Gifts Under 5 Dollars) to Premium Baseball Keychains for Coaches (around $20.00). Affordable and a neat way to show your coaches just how much you appreciate all the time and effort they gave to the team. You can write COACH’S NAME in place of the “Team or Name” temporary text. Custom Personalized Baseball Coach Gifts that they will enjoy. Cool Personalized Baseball Coach Ideas that are very unique. 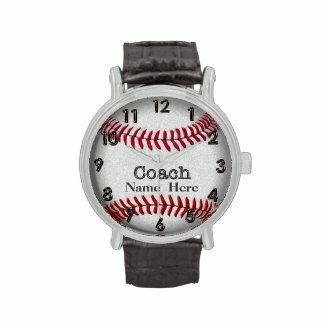 Coach Gifts Under 50 is the first baseball watch shown. You can choose from different style watches and price points. The first Baseball Watch does not need any customization. You can buy it as you see it or change the style. It has a soft comfortable vintage leather black band with large easy to read number watch with the baseball and a cool metal like “Coach” in red. 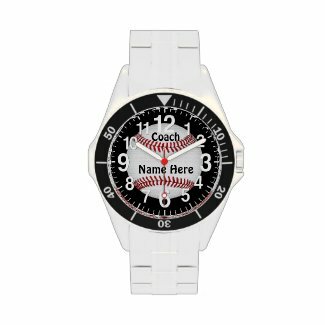 The second Baseball Watch is a Coach Gifts Under 100 dollars for those who have many of the team mates chipping in for an extra special Personalized Baseball Watches Men. The Baseball Watches for Coaches were a big hit as Christmas Gifts. The Personalized Baseball Coach Gifts and Custom Gifts will be a memory your coach will never forget. 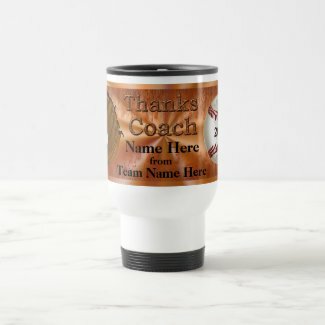 Custom Personalized Baseball Coach Gifts for the most Unique Coaching Gifts they have ever received. You will definitely be remembered and appreciated with any of these cool coaching gift ideas. Great Gift Ideas for your Baseball Coach. How much fun will it be to give your coaches Matching Personalized Baseball Coach Gifts. 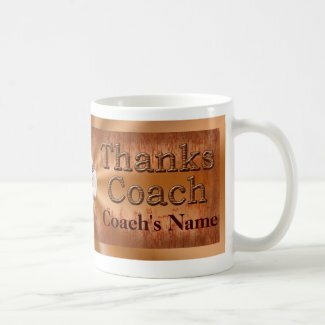 Personalize for ONE COACH at a time, Add to Cart then go back and personalize the next Coach Mug and or Thank You Cards for Coaches. 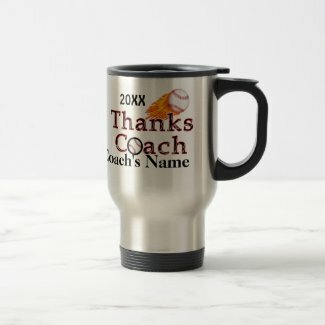 I know they will love these Personalized Baseball Coach Gift because they are unique, cool and you took your time to create them. Type Your Text into the Text Boxes for these Personalized Baseball Coach Gifts. ALL text can be changed to whatever you wish to say to your coach. 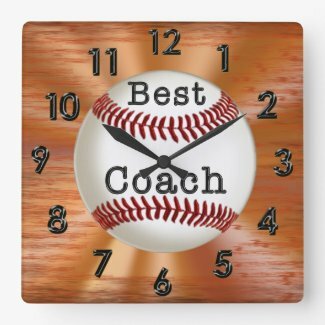 Personalized Baseball Coach Gifts for that extra special touch. Once you are on the Baseball Gifts product page, to your right you will see the “Personalize it” area. Type your Text into those Text Box Templates. Be sure to scroll all the way to find all text boxes. 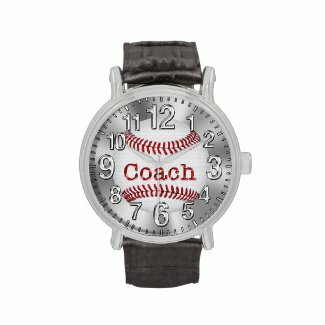 Baseball Coach Gifts Under 50 or choose the Stainless Steel Watch Style for Coach Gifts Under 100. 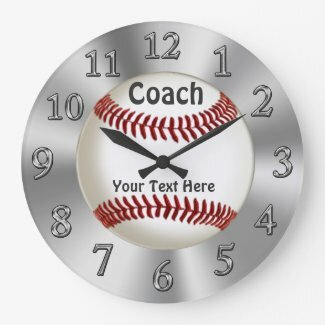 The Watches for Coaches is a cool silver Baseball with raised looking threads and a metal like “Coach” with Your COACH’S NAME below.The Coach Mugs have Two Text Boxes to type in the YEAR and the Coach’s NAME or real short Message instead. Really cool and Personalized Baseball Coach Christmas Gift Ideas. Text Boxes are located to the right of each of the customizable gifts under “Personalize it”. You shouldn’t need to but for further Customization, Click on the Blue “Customize it” Button. For more than one Coach Gift, Personalize ONE at a TIME, then “Add to Cart” and Click YOUR BACK Arrow to return to the same gift or Zazzle’s “Keep shopping” link to return to other Zazzle gifts. Repeat. It will only take you a minute or two to personalize each gift depending on how many Text Boxes are available for personalization. I strive to make Unique Baseball Gifts for Coaches that are cool, customizable and special. Give an out of the ordinary gift that is practical and memorable. Your coaches will remember your team forever. 100% LOVE IT Guarantee with an amazing fewer than 1% of Gifts are ever Returned to Zazzle. I love that they earned an A+ BBB, Better Business Bureau RATING. BBB.org is one of my go to websites before making big buying decisions in fact, 4 days ago, BBB saved me from having a service call to check out our air conditioner that my husband set up. 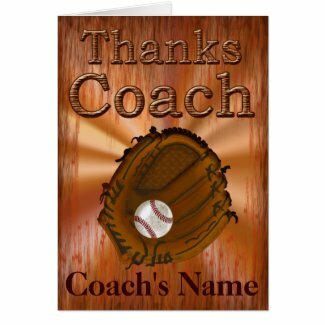 I really appreciate and want to Thank you for shopping our Personalized Baseball Coach Gifts. If you didn’t find what you are looking for, please call me and I will try to design something just right. It is very easy for me to make changes to my designs because I work with separate layers for each piece of the design. Calling me at: 239-949-9090 is best as I don’t want to miss your emails amongst all the spam I get or Click the Contact button above to email me. I love creating these cool coaches gifts. If you have any ideas that you would like me to work on, I would love to hear from you. God Bless ALL the Coaches who take the time to train our children to not only succeed in sports but in life too. I attribute part of my son’s success to his involvement in sports. He is extremely reliable and successful in his career at a very young age. The discipline they learn in sports, I believe, really helps them in life. Of course, as a mom, I would like to take some of that credit too. Coaches do so much for our kids they really do deserve so much credit. I really appreciate and want to Thank for visiting our Gift Ideas for Baseball Coaches article. Call Linda at 239-949-9090 if you need help customizing any of the personalized baseball gifts for coaches. I can customize it for you at no charge.